Black henna contains high levels of PPD (para-phenylenediamine), which can cause skin irritation, blistering, scarring, and more. Click HERE for more information. Henna is NEVER BLACK! 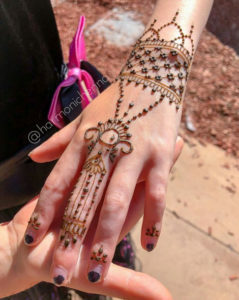 Natural henna may vary from a green to dark brown color. 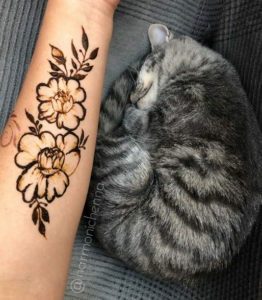 Jagua ink appears to be black and can be confused for henna, especially since many henna artists also offer jagua tattoos. 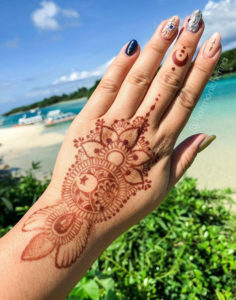 Some henna artists mix henna powder and jagua to achieve a darker stain. A good henna artist makes their own henna or purchases their henna from a local and reputable artist that makes their paste fresh. Remember, henna is highly perishable and should be kept in the freezer when not in use. 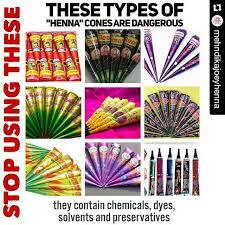 Any henna artists using commercial looking cones is not using natural henna, even if it says “organic” or “natural” on the packaging. Your henna artist should be able to tell you all of the ingredients in their paste. These cones can cause harm to others!